I was having my share of secret fun bookmarking many options, but then I stumbled on her post on Chai Brownies and noticed the date of its publication. March 11th, 2007. I know well a person who was born on March 11th. No, not 2007, but who cares? A few years here, a few there, compared to the time since the Big Bang, it’s a blink of an eye. I looked no further. Still, let me share with you some of the other recipes I had in mind: Prosciutto and Artichoke Quiche (oh, my! ), Baked Chicken and Spinach Flautas (check this recipe out, very nice interpretation of a classic), Lamb Meatballs in Cumin Scented Sauce over Spaghetti Squash (I must make this soon), Pasta with Brussels Sprouts, Pecans and Gorgonzola Cream Sauce , Mussels in Saffron Tomato Sauce (simple and irresistible), and her Lemon Chicken Soup with Tortellini. But there’s a lot more, as you might imagine from a food blog that has been around for seven years! And, before I move to the recipe, take a look at Dorothy’s site, Shocklingly Delicious, to see which recipe she chose from my blog (one of my favorite cakes ever and the most popular recipe of BK last year). She wrote such a wonderful post about it, I cannot stop smiling…. Thank you, Dorothy! Add the ingredients for the spice mixture to a pot and bring to a quick boil. Remove from heat and let sit for 10 minutes. Strain into a large microwave safe bowl. To the bowl of chai, add butter and chocolate. Microwave about 30 seconds until melted. Stir until smooth. Let cool for a minute. Add egg. Sift in remaining dry ingredients and mix until it forms a stiff batter. Bake in a Pyrex dish sprayed with oil, about 25 minutes until set. Let cool, and cut into pieces. In the United States, chai often describes what should be instead called masala: a mixture of spices such as cardamon, cinnamon, allspice, ginger, that can be used to brew black tea, creating masala chai. By itself, “chai” is a word that means tea, and has its origins in Chinese. Interestingly enough, it is the same word used in Portuguese – chá – although the pronunciation is slightly different in both languages. I love the flavors normally associated with masala chai, and thought that the marriage of a good old-fashioned chocolate brownie with such warm spices would be perfect. And perfect it was! I did not have whole allspice berries in my pantry, but decided it was worth getting a jar, so now I am the proud owner of two allspice products, one whole, one ground. Gotta put them to good use before they lose their punch. These brownies brought a lot of excitement to a cloudy and cold Monday morning in our department. I loved the delicate flavor of cardamon in the background, and the texture of the cake, with a crackled surface was wonderful too. Lauren, it was great to get to know your blog better, and I urge my readers to stop by her site and browse through, particularly if you like to see recipes that are lightened up without loss of flavor. For those interested in joining our virtual monthly party, click on the crazy-looking amphibian smiling at the end of this post. TWO YEARS AGO: Still got stout? These look amazing, how fun to belong to a secret recipe club. I just had a hot chocolate and chai drink this morning. Love chai. Secret Recipe Club is FUN! I learned today that the waiting list for new members can be of 1 year! Can you imagine that? Glad I am IN! The brownies were, of course, lovely but what really caught my eye was the lemon chicken soup with tortellini which I want to make soon. You picked out some great recipes this month! But I really love the sound of these chai brownies. What a perfect infusion of flavor – and chai + chocolate = perfectly delicious. Great choice!! I love chai tea, and I’ve actually used chai in cakes before, so I think it’s a wonderful idea! 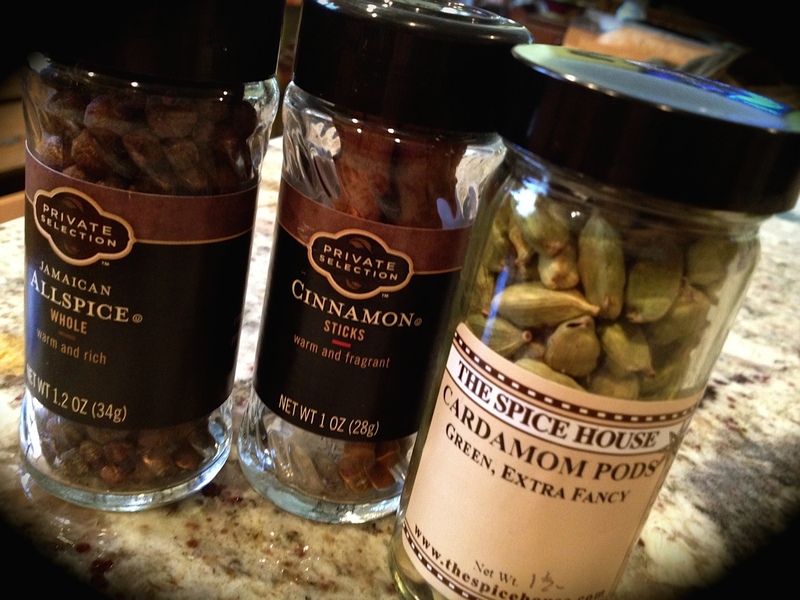 These spices go well with chocolate, no doubt… hope you try this! I love the secret recipe concept. What fun to choose something intriguing like these brownies. I haven’t made brownies of any sort for way too long. There is an appalling lack of brownies in my house right now, which I can soon remedy with this recipe. Well done! And thank you for the shout out about my post on your apple cake. Truly one of my new faves. I am wearing out my Springform pan baking it repeatedly. Love being in SRC with you, Sally! What temperature did you use to bake the brownies? Oh, yum! I love chai and I love brownies, so I bet I’d adore these. They look and sound fab! Agree completely! Glad I picked this recipe…. What a great idea!! Love chai but would have never thought to use this flavour combination in brownies (not sure why…) — I’ve used it in puddings, mousses and all kinds of things, just seems natural to have it in chocolate too ;-). 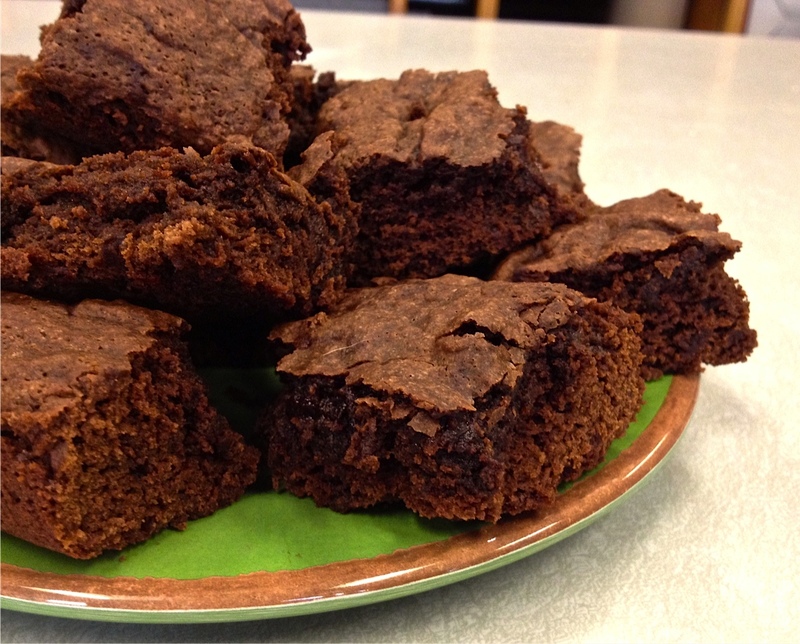 Bet these brownie delights would bring a lot of excitement any day of the week :). LOL, will do! (I’m trying to be good… in ‘spring training’ 😉 ). I love chai. Even before I checked my comments, I had spied this recipe in the linky list. Great pick! Great, I hope you try this recipe, if you love spices, you’ll love this! Chai is one of my faves! These sound really, really good! Great SRC pick! Hello Sally, I love the idea of chai brownies! I always add cinnamon and cardamom to any chocolate recipe, they add a nice warm depth of flavor. Love this post – great recipe choice too! Thank you for sharing!! Oh wow! These look absolutely amazing! Pinning right away. I’ve never heard of chai brownies before..sounds really interesting! Love that you pointed out the difference between chai and masala…we always get a kick out of reading Chai Tea in menus…b/c it means Tea Tea 🙂 Great SRC pick! Glad to see I am not the only one having fun with the “Tea Tea” – but, as I replied to Sawsan, it is a losing battle. I fought similar battles already, like using “hamburger” as interchangeable with “ground beef” – boy, that makes me mad. It is NOT hamburger unless you shape it into patties! Don’t tell me you will buy “hamburger” if you intend to buy ground beef…. 🙂 See? I am a pain to be around…. Great, now I want brownies. Spice and chocolate go so well together – these sound wonderful, great pick! Thank you! thanks for stopping by and saying hello! I love chai, I love brownies. These need to happen!! There you are! Great to see you here, as busy as you are! Can you please send me a batch?! We had chai cake at our wedding, but Ryan would have LOVED the chocolate addition. I can’t wait to try these once we get moved in! I can imagine how anxious you are to move and settle and get going on a new phase…. hang in there, it will all have a wonderful happy ending! I love your language alert Sally. So cute. I hope your trip was wonderful too. Beautiful brownies and such an nice note to Dorothy. Well, Dorothy is the one who did a wonderful, super sweet post about my blog…. she is a very active and major participant of the Secret Recipe Club, I am so happy she got my blog this month, made me feel great! I am so far out of the loop, Sally. I’ve never used quinoa nor have I prepared chai anything. I haven’t even been to THAT coffee shop for a chai tea. I did make something with chia seeds, though, so there’s still hope for me — I hope. These brownies do look good and it’s easy to see why you’d choose them for your post. I may be out of the loop but this is my lucky day. I get a great brownie recipe and a new blog to check out. Not bad, eh? Thanks, Sally. John, that chia seed thing made me laugh….. I understand it so well, each year it seems that one ingredient it “in”, and if you don’t cook with it, you are “out”. Lauren and I have hung out on a number of occasions, and she is great! As is her food. 🙂 I haven’t made these brownies of hers, but they are moving up on the to-do list! Your pet peeve with “chai” reminds me of my old roommate’s pet peeve with “curry”, which really just means sauce. It drove her crazy when I said I was making curry because it’s not really a specific thing. Oh I have some chocolate Chai tea somewhere that would be great for this. Oohhhh, I am always looking for new and exciting brownie recipes, thanks for sharing this one.